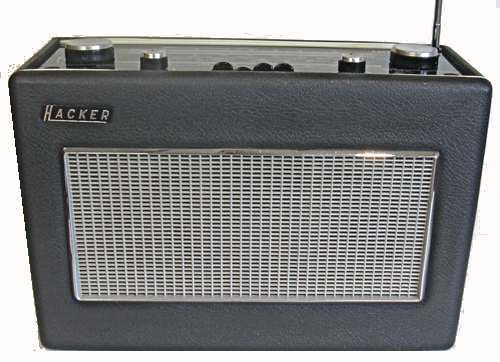 Portable Transistor radio Made by Hacker Radio Ltd, Maidenhead UK. I now have two of these radios one is grey/blue and the second is black. They are housed in a leatherette covered wooden case with black knobs an chrome trim. The RP18 has three Wavebands (AM 185 - 560 metres Medium Wave, 1000 - 1850 metres Long Wave and FM 87 - 101 MHz). This model is normally powered by two 9 volt PP9 batteries in series. The blue one is of two Hacker radios that I purchased for £ 10.60 and the black on is one of a job lot of six radios purchased for £20 on Ebay. working Maidenhead, UK 1964 approx. View of interior. 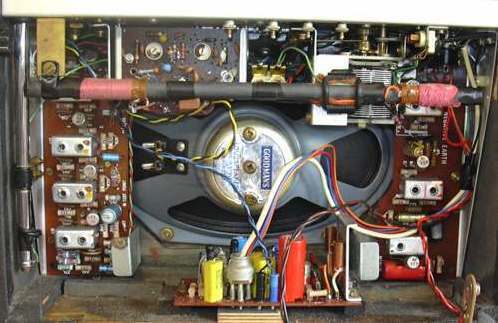 Note the substantial loudspeaker and separate audio amplifier and the connectors for two 9 volt batteries. When I first energised the blue radio I found that although it seemed to work fine on medium and long waves the VHF band was completely silent although the VHF circuitry (on the left on the above view) was energised. This employ four Mullard AF114 transistors and I soon discovered that the one just below the ferrite aerial was faulty. I knew that these transistors do cause trouble and noted that someone had been through the set and snipped all the screen leads. However the internet helped me on my way and I discovered a wealth of tips on http://www.vintage-radio.net/forum/ and the method I tried was to temporarily solder the connections to the leads on the underside of the printed circuit and to discharge 50 Volts from a 500 mFd between the case and my solder link. The radio then worked on FM but not for long! I discovered that another needed the same treatment and so I decided to treat the other two for good measure. Giving the offending transistor a sharp knock seems to only give a temporary repair. I see that the VHF tuner has lost its screening cover. The black radio again only worked on the medium and long waves and I found that the AF114 transistor in the second IF stage of the VHF section was open circuit. I replaced this with a working AF117 and the radio came to life once more. The Hacker 'Sovereign' is a 15 transistor (plus 7 diodes) portable radio receiver, designed for the highest possible quality reception of both AM and FM VHF broadcasting from a portable receiver. It features two separate tuners, one for AM reception and the other for FM, with common controls and amplifier. This dual receiver arrangement has many advantages in design and eliminates many disadvantages of combined receivers using common transistors and components. High sensitivity is essential for good FM reception and this is ensured by four I. F. stages. 1) Automatic Frequency Control (AFC) on FM with 'Quiet Tuning' button for noiseless tuning and local station identification. 2) Common tuning control for AM and FM. 3) Separate tuner and IF strip for AM and FM with common amplifier. 4) Push button wave-change and 'quiet' tuning control. S) Three adjustable station markers for FM local stations. 6) 10" ferrite rod aerial for AM and telescopic rod for FM. 7) Large elliptical 8. x 5. speaker delivering 1.2 watts output direct coupled, transformer-less audio push-pull amplifier (negative earth). Volume control/On-off switch. Independent Bass and Treble controls. Push button function switch. External sockets are provided for AM or FM aerial, Audio output at diode level for tape recording, Audio input socket for gramophone pick up microphone or tape replay and Output for personal earphone. Click here for an interesting light upon the manufacture of some Hacker radios.